I don’t know about you, but I found it impossible to find unusual, artsy tablecloths for my wedding reception. Everything offered by rental companies was too polyester-y or plain-Jane. Totally frustrated, I started rummaging around online and found Tradesy, a cool site where brides can buy and sell new and lightly used wedding reception linens, props, etc. 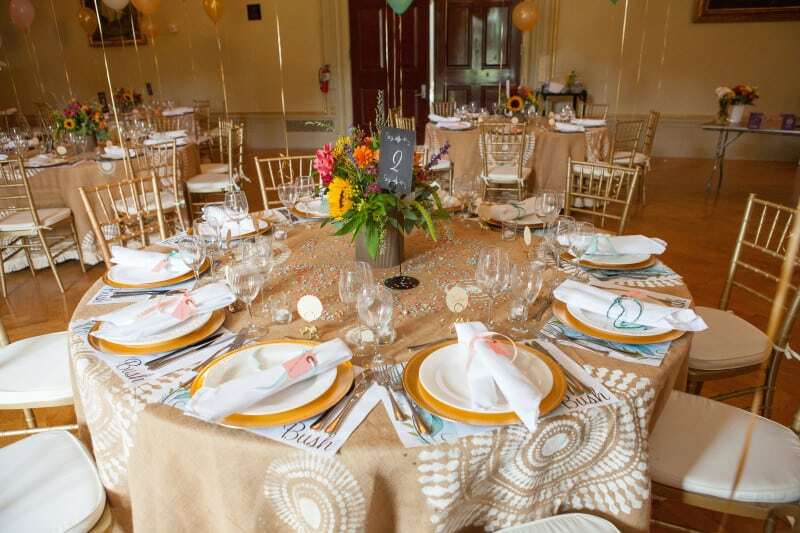 So I started browsing hundreds of tablecloths and finally found an artist from Pennsylvania who had the talent and patience to design and create handmade burlap tablecloths for her daughter’s recent wedding. She had posted images and was willing to sell her creations for a reasonable price, and I was instantly captivated. My own wedding would have a decidedly Boho vibe (my dress and decorations were from Free People), so I was thrilled to buy Marybeth Rucker’s burlap tablecloths with hand-applied oversized sunburst stencils and cotton fringe. Decide on the size of your reception tables and allow for a drop of approximately 30 inches. Call your party rental center and get an exact table measurement so that your finished tablecloth (with fringe) just hits the floor. Sew simple seams in your burlap. You might even want to baste rather than make tight stitches. Next, buy or create your own big stencils. I like the sunburst pattern that Marybeth used. Decide if you want to attach fringe. (I think it makes the tablecloths more festive and special.) You don’t even have to sew on the fringe. Just use a hot-glue gun. Leave plenty of time to position the custom cloths on your reception tables before your event. You will need to buy or rent a good-quality steamer to touch up the cloths because the burlap is sure to wrinkle in transit. These tablecloths are great for a casual barn wedding or you can use them in a very formal space to create a whimsical atmosphere. If you dislike standard-issue polyester or poly/cotton tablecloths as I do, this DIY idea will give your wedding the personalized touch you crave.